A reader asked me to evaluate in general the Glenmore neighborhood over the last 5 years. As you can see the average house price has hovered around $700K. 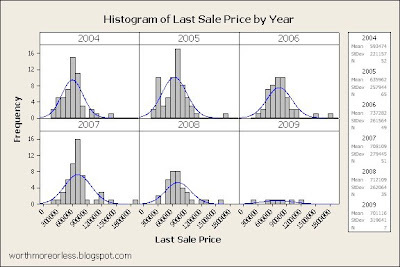 There are only 7 sales in 2009 in Glenmore so it is not much of a distribution to draw any conclusions from. There has only been 7 properties that have sold in 2009 for Glenmore, and the average price paid is $12.5K LOWER than assessed prices. 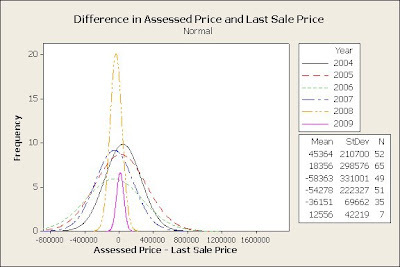 Bear in mind that I am using 2009 assessments to compare to sales in previous years, that is why 2006, 2007, and 2008 show negative differences because at that time the market was higher than it was now, and I am not using the corresponding years assessment data to compare it to. What does this all tell me? Glenmore on average has held values around $700K and probably will continue to do so, however with more focus being paid on assessed value property owners will probably be thankful for higher assessments.